Charles H. Warren, “From the California Assembly to the Council on Environmental Quality, 1962-1979: The Evolution of an Environmentalist,” an oral history conducted in 1983 by Sarah Sharp, in Democratic Party Politics and Environmental Issues in California, 1962-1976, Oral History Center, The Bancroft Library, University of California, Berkeley, 1986. Over the past half-century, California’s electric utility companies have experienced waves of change, challenge, and crisis while producing power and earning profits for their shareholders. Most recently, the San Francisco-based Pacific Gas and Electric Company (PG&E)—one of the largest investor-owned utilities in the United States—began 2019 seeking chapter 11 bankruptcy protections in lieu of deaths and damages from destructive wildfires for which it may be liable. PG&E last declared bankruptcy in 2001 during the California energy crisis under quite different and convoluted circumstances, including the convergence of severe drought, high temperatures, and pricing manipulations derived from poorly designed deregulation of California’s energy markets in the mid-1990s. The energy crisis in the 1970s, however, stands out for its onslaught of economic, environmental, and political overlap, which left many businesses and policy-makers at a loss with how to cope and move forward. The 1974 “Energy Crisis Bible” by Henry R. Spies, Seichi Konzo, Jean Calvin, and Wayne Thoms, pref. 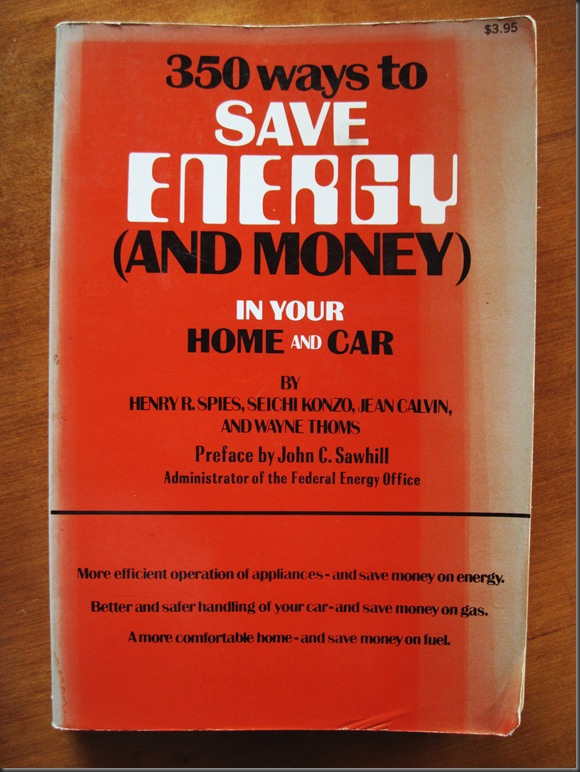 by John C. Sawhill, 350 Ways to Save Energy (and Money) in Your Home and Car (New York: Crown Publishing, 1974). By 1976, fuel shortages and forecasts of rolling blackouts from California’s utilities spurred then Democratic Gubernatorial candidate Jerry Brown to characterize the 1970s as “an era of limits.” From 1962 through that “era of limits,” Charles H. Warren served as a leading Democrat in California’s Assembly. Warren’s legislative response to California’s energy issues in the 1970s gained national recognition and led him, in 1977, to join President Jimmy Carter’s cabinet as chair of the Council on Environmental Quality. Warren addresses all this in his oral history interview, recorded in the early 1980s. Amid new energy challenges facing California’s utilities today, revisiting Warren’s oral history reveals how one legislator in California’s Assembly confronted the 1970s energy crisis, sometimes supporting and other times challenging California’s powerful utility companies. Most memories of energy in the “era of limits” trace back to October 1973 when Saudi Arabia and other Arab nations in OPEC—the Organization of Petroleum Exporting Countries—halted exports of crude oil to the United States and its allies. Arab members of OPEC initiated their embargo as punishment for American military support of Israel after Syria and Egypt launched a surprise attack against the the Jewish state on Yom Kippur. OPEC’s oil embargo lasted only from October 1973 through the spring of 1974, but it sent shock waves throughout the industrialized world. For one, the price of oil suddenly quadrupled. The U.S. economy contracted, throwing millions of Americans out of work, while those who kept their jobs saw minuscule progress on wages. As a member of California’s assembly, Charlie Warren played an outsized role in drafting California’s legislative and regulatory responses to the 1970s energy crisis. Yet in his 1983 oral history interview, Warren explained how California’s utilities expected critical energy shortages much sooner than you might expect. A few years before the OPEC oil embargo, California’s electric utility companies warned state legislators of a separate impending energy crisis. Warren recalled, “during 1971, the major electric utilities in California, PG&E, Southern California Edison, and San Diego Gas and Electric, advised legislative leaders that unless the state took certain action, in the foreseeable future there would be shortages of electricity with resulting brownouts and blackouts of indefinite duration.” The problem, according to the utilities, was that regional and local governments in California made it increasingly difficult to site new and necessary power stations, particularly new nuclear plants fueled by uranium. In response, the utilities succeeded in passing legislation through the California Senate that would preempt the jurisdiction of local governments and regional agencies for siting new power stations. In the Assembly, that legislation came to the Planning and Land Use Committee on which Charlie Warren served. Warren and fellow committee-members feared the utilities’ energy forecasts but felt reluctant to approve legislation that removed local control for locating power plants and put it the hands of a new state agency, as requested by California’s utilities. The committee decided the issue required deeper investigation. Warren found himself chairing a new subcommittee on energy that contracted with the Rand Corporation in Santa Monica to evaluate California’s electrical energy system and the utilities’ anticipated crisis. The Rand Corporation had, until that time, exclusive contracts with the U.S. military for complex systems analyses, especially scenarios involving global nuclear war. Yet Rand began expanding their research into the non-military policy area, and this contract with California’s state government afforded an early opportunities to do so. Warren’s subcommittee received the Rand report in October 1972, and as he recalled, “I was so startled by its findings that my life was changed.” Warren’s responses to this report reshaped regulation of California’s energy landscape and catapulted him to national attention as a legislative expert on energy issues. The Rand report substantiated the utilities’ anticipated energy crisis. According to Rand’s analysis, California’s annual demand for energy was growing so rapidly—and was forecast to expand at similar rates over the next twenty years—that avoiding projected blackouts would require all of California’s then-existent electricity production to double every ten years. That is, the entire capacity of California’s electric output would need to completely replace itself every decade, all while maintaining its existing output. To make matters worse, the Rand report also noted how the traditional means of generating electricity with natural gas and low-sulfur crude oil were becoming increasingly scarce and more expensive (even before the OPEC embargo restricted the availability of crude oil and quadrupled its price!) Rand further reported that, in response to these anticipated challenges, California’s utilities planned to generate this additional energy with scores of new nuclear power plants. The utilities projected that, by the year 2000, an additional one hundred large power plants would be required throughout California, at least eighty of which they imagined would run on nuclear fuel. Before deregulation of California’s energy markets in the 1990s, utilities operated as profitable, state-sanctioned monopolies. For California’s investor-owned utilities like PG&E and SoCal Edison, a surge of newly constructed power plants would not just meet the state’s rapidly growing energy needs, it would substantially boost the utilities’ bottom line. At the time, most Americans had limited knowledge or concern about nuclear energy. Indeed, most Americans in the early 1970s still believed nuclear power would provide energy too cheap to meter and do so without significant consequences. However, the Rand report expressed considerable apprehensions both about nuclear generator technologies and reliance on nuclear energy to the extent California utilities thought necessary. 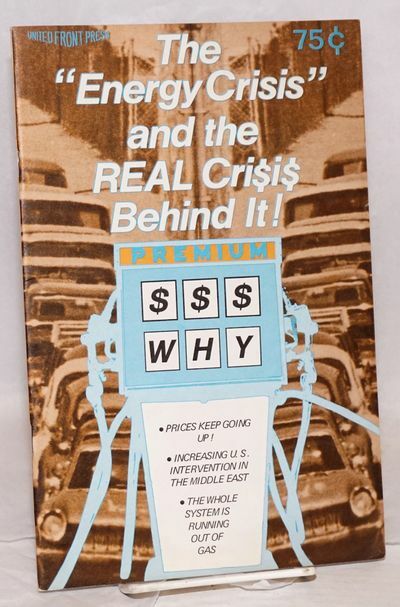 1974 Energy Crisis book by Dave Pugh, Mitch Zimmerman, and Gar Smith, The Energy Crisis and the REAL Cri$i$ Behind It! (San Francisco: United Front Press, 1974). Instead, Warren drafted new legislation for substantial changes to state energy policies that, without mentioning nuclear power, relied on significant land use and water requirements for the siting and operating of new power plants. Overcoming his initial hesitations for a new state entity, Warren’s legislation proposed a new energy agency that would adopt conservation measures in all electricity consuming sectors; it would encourage the development of alternative energy resources, specifically solar and geothermal; and it would conduct independent energy forecasts for electricity similar to what the Rand report did. After some additional amendments, Warren’s legislation passed both the California Assembly and Senate. By early Autumn in 1973, Warren’s legislation arrived on the desk of California Governor Ronald Reagan, who vetoed the bill. Within a few weeks, however, the OPEC oil embargo suddenly made energy a serious political concern. Reagan’s staff realized Warren’s bill had merit and regretted its hasty veto. The governor’s office soon contacted Warren to create a new policy together that would confront the energy crisis—a crisis that California’s utilities had in some ways anticipated. Over a period of several weeks, Warren began “extended negotiations with the governor’s staff, and with the governor personally,” as well as intense meetings with utility representatives, legislative staff, and state agency officials. Together, they produced what became known as the Warren-Alquist State Energy Resources Conservation and Development Act, or Assembly Bill 1575, which was markedly similar to Warren’s earlier bill that Reagan first vetoed. California’s utilities disliked AB1575, but they supported it at Reagan’s insistence. “The governor’s support,” Warren remembered, “was at some political cost to himself. I recall a staff person who had been given responsibility for energy policy resigned and Lieutenant Governor Ed Reinecke who was campaigning for governor publicly announced his opposition. But Reagan kept his word.” With the governor’s aid, AB1575 moved through California’s Assembly and, by a margin of one vote, it found approval Senate in 1974. This time Reagan signed it, marking the nation’s first substantial legislative effort to confront the 1970s energy crisis—not through inefficient if profitable new power plants for utility monopolies, but through energy conservation, increased analyses, and pursuit of alternative energy sources.